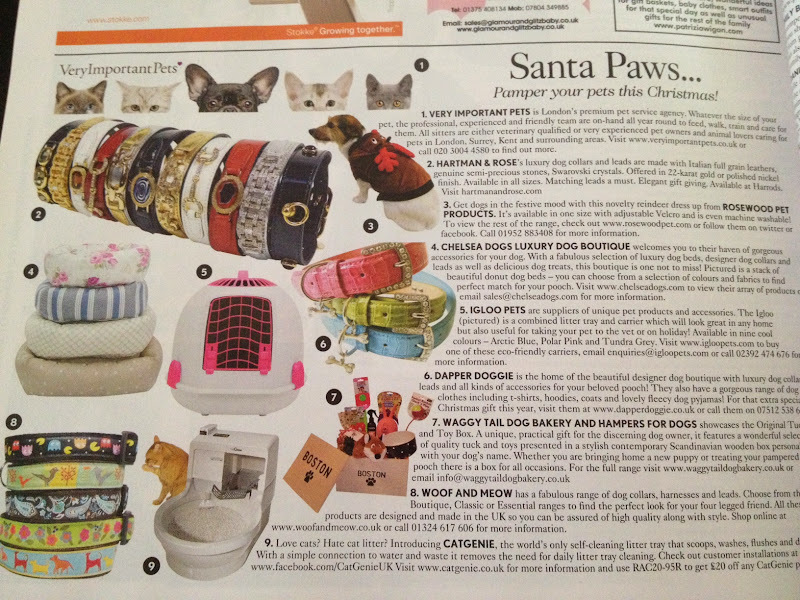 Chelsea Dogs has been featured in Vogue's Santa Paws great gift ideas for your pet this Christmas. Featured is our lovely stack of Hugo & Hennie's Donut Dog Beds which come in a wide range of fabric choices all of which will look fabulous in your home. 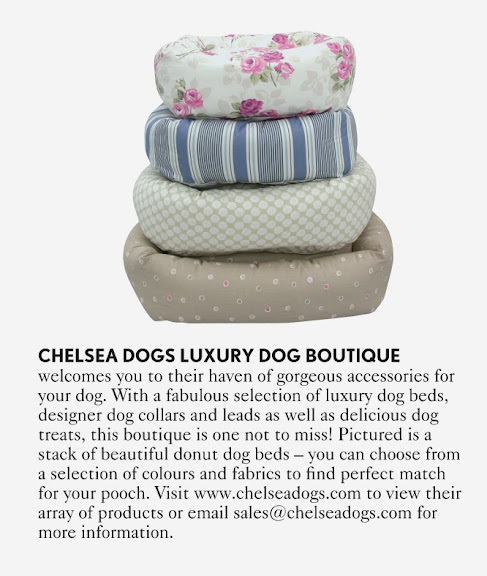 Click the image below to find out more about these luxury dog beds. 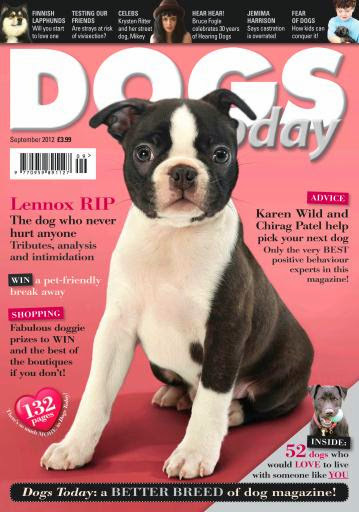 Chelsea Dogs is featured in the September 2012 issue of Dogs Today Magazine! 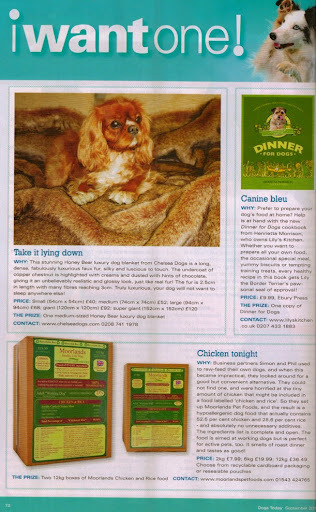 Chelsea Dogs has featured twice in the September 2012 Issue of Dogs Today Magazine! 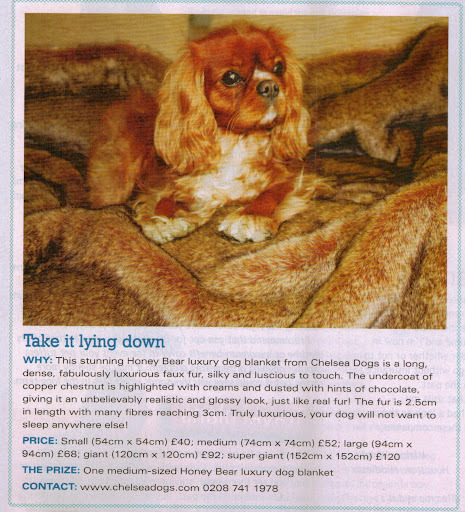 Our first apperance is in the 'I Want One' feature where one lucky reader will win lots of lovely dog accessories and treats including one of our luxury faux fur dog blankets! 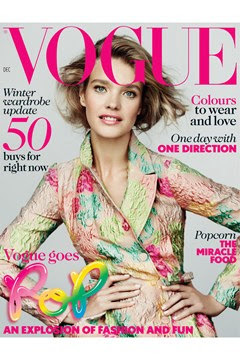 Our second feature is in the 'Chic Boutiques' section! Of course we sell lots of designer, handmade and bespoke products, some which are exclusive to us so you will not find them anywhere else on the high street or the web! New luxury dog boutique Chelsea Dogs believe that every pooch deserves to be pampered. If your dog is the number one star in your life, then you will love to treat your pet to their range of luxury plush dog beds, collars, leads, toys and accessories. 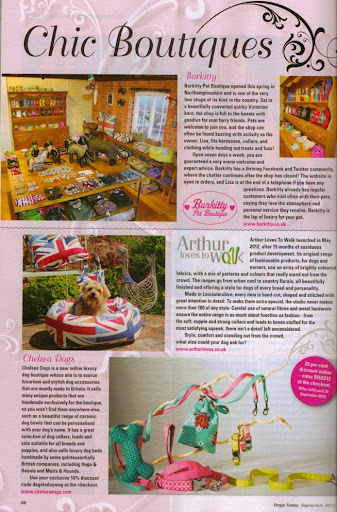 Chelsea Dogs even has a dedicated Gifts For Dogs section, which offers chic and stylish treats for the dog that has everything. There is also a stylish collection of home accessories, including the chic toy bags, such as the Luxury Dog Toy Bag Scottie, which will keep all your pooch’s toys neatly in one place. The toy bags range is exclusive to Chelsea Dogs and they can be personalised with your dog’s name to add that special touch. Chelsea Dogs are proud to keep their carbon footprint low by supporting local businesses and around 80 per cent of their products are made right here in Britain by leading brands such as Dogs & Horses, Hugo & Hennie and Mutts & Hounds. Quintessentially British designer, Dogs & Horses' leather dog collars and leads are also available to buy online at Chelsea Dogs. 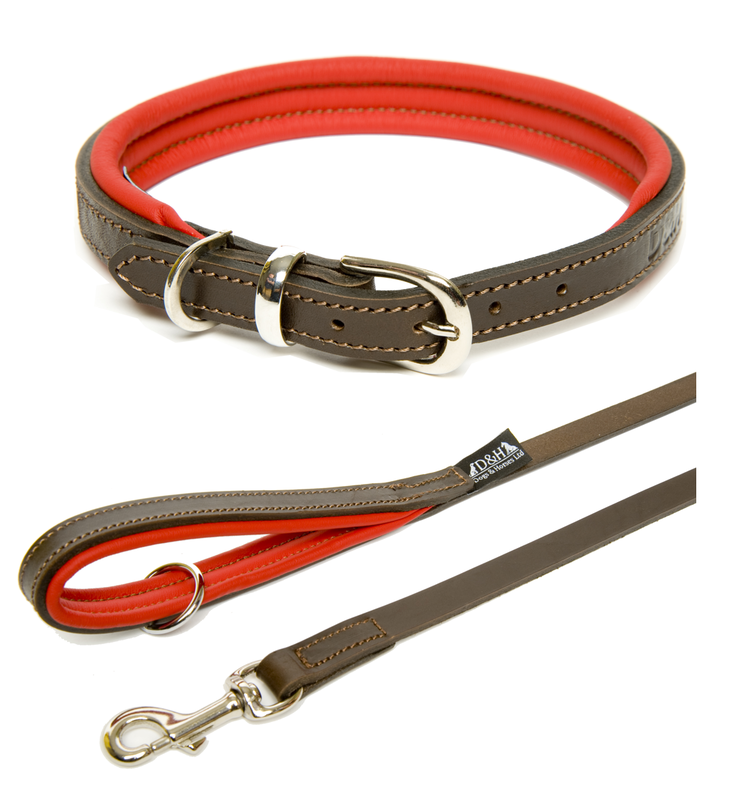 Using the finest leather and solid chrome and brass fittings, Dogs & Horses’ range of luxury leather dog collars, leads and sets are what Britain’s best-dressed dogs are wearing. Their new Colours Collection is so chic and comes in a range of stylish contrasting hues. Dog lovers who want to add a touch of canine chic to their home won’t be able to resist the cute Luxury Dog Doorstop Rose or the Luxury Scottie Dog Cushion. The home accessories collection also includes memo boards, handmade lavender hearts and blankets that will add a chic touch to any room of your house. Chelsea Dogs also works in partnership with the talented artist India Amos, who is available for private commissions through the website. Her pet portraits capture the character of your dog beautifully and they make a gorgeous gift for a loved one or yourself. 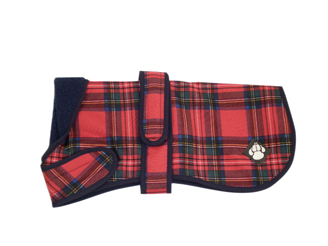 For discerning dogs, there is a stylish range of clothing, including waterproof dog coats, cosy quilted coats and cute little jumpers. They comes in a variety of sizes to suit all breeds too. If you’re going to treat your pup to stylish beds, bowls and jumpers then you’ll want to make sure their collars and leads are on-trend too. Fashion-conscious pooches will love the chic collection of collars, leads and harnesses, which includes collars adorned with pearls and crystals and the Steam Punk Charm designer Leather Dog Collar. 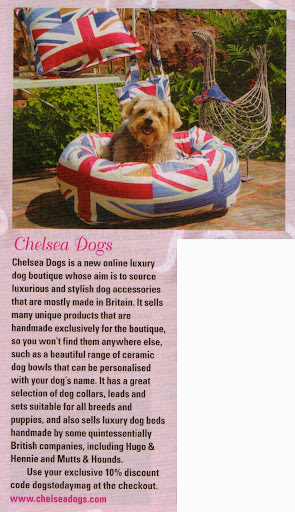 If you wish to view the full range of luxury dog products, take a look at Chelsea Dogs’ website at www.chelseadogs.com. You can also connect with them on Twitter at @chelsea_dogs and on Facebook at www.facebook.com/chelseadogs.